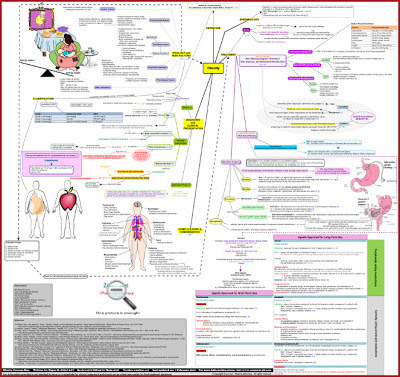 The aim of this concept map is to clarify the approach for evaluating and managing overweight/obesity patients. The map starts with the definition of Obesity "obesity is excess body fat. It is defined as a body mass index (BMI) ≥ 30 kg/m2." and the epidemiology. 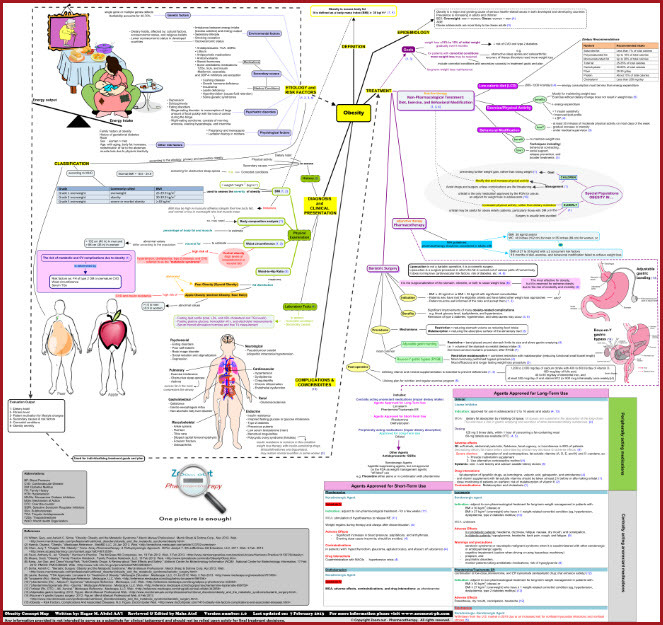 On the left side of the map, you'll find obesity etiology and risk factors stated and represented using a funny image that will help you memorize this part easily. 1- History; it is important to assess patient's dietary habit, physical activity level, whether obesity is due to one of the secondary causes or not, and if the patient have any of obesity comorbid conditions that should be managed besides to obesity. · Body composition analysis; assesses percentage of body fat and muscle. 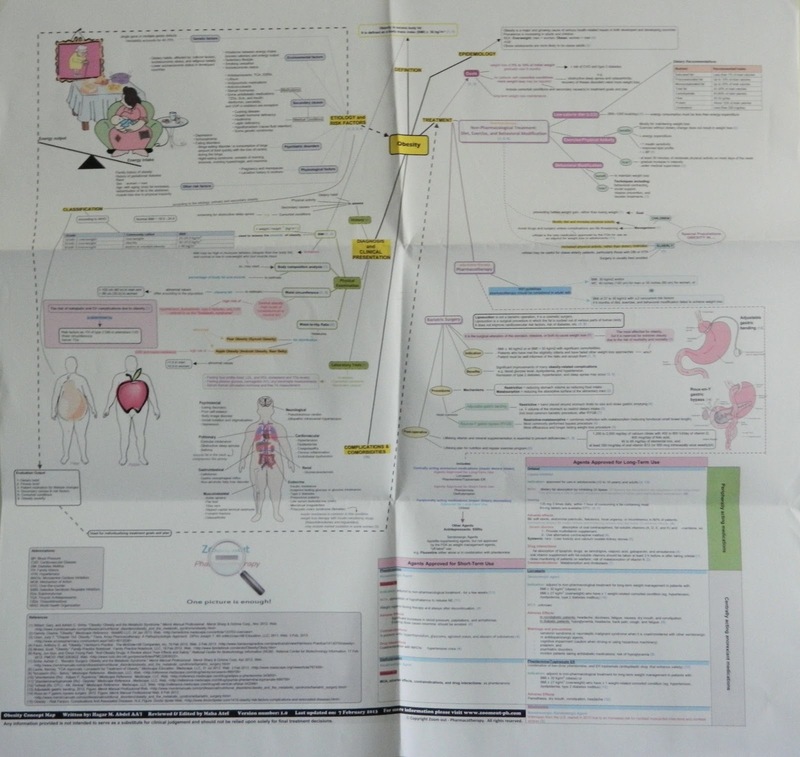 They are stated in the map using a simple figure showing sites of organs exposed to obesity complications. Overall they can be: psychosocial, neurological, cardiovascular, endocrinal, musculoskeletal, renal, gastrointestinal, and/ or pulmonary. Using the previously mentioned aspects of obesity – risk factors, secondary causes and information got from diagnosis and clinical presentation - individualized treatment goals and plan are to be set. The map includes treatment goals and approach. 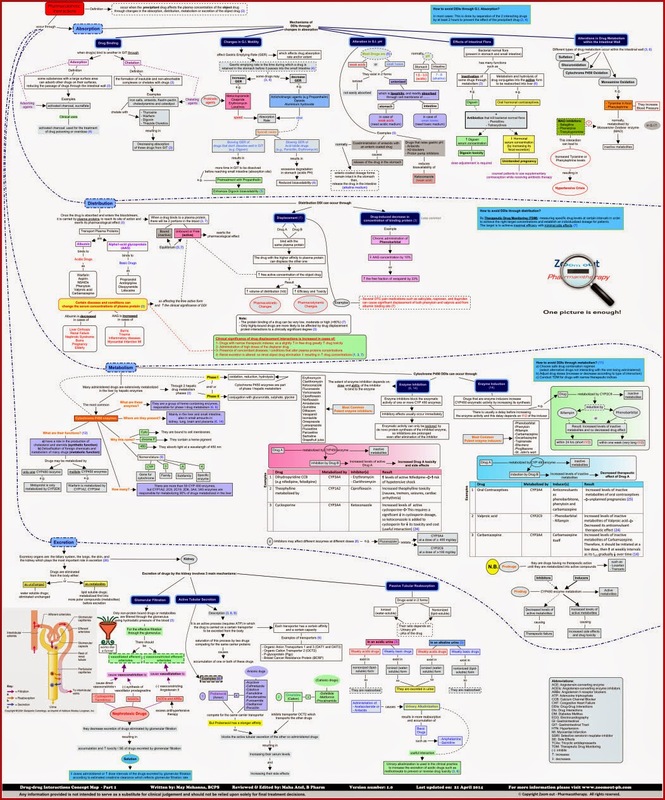 First line therapy for obesity is Non-Pharmacological Treatment including: Low-calorie diet (LCD), Exercise, and Behavioral Modification – benefits of each and more details are stated in the map. Bariatric Surgery – the map explains its indications, benefits, most common procedures (Adjustable gastric banding - Roux-en-Y gastric bypass (RYGB)), and post-operative maintenance and supplementation. This map will help you link between obesity etiology and/or risk factors and diagnosis for the aim of individualizing therapy. The map is split into pages to be printed on six A4 papers. After printing them, you have to tape the edges together to make a folded poster. 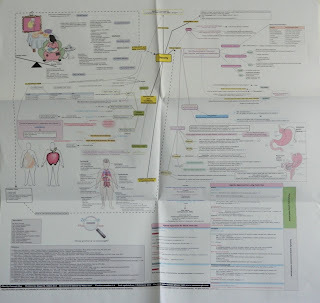 Obesity concept map is written by: Hagar M. Abdel AA'l, B Pharm.